Penn's Store is not the easiest place to find. We are nestled in the knob region of Kentucky. This map should help. The map shows references to cities and interstate highways. Click on one of these landmarks or cities to show written directions from that place. We hope this helps. 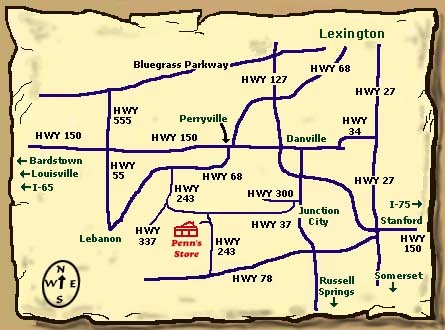 There are a number of ways to get to Penn's Store from Lexington. We recommend: Take Hwy 60 (Versailles Road) west (past Bluegrass airport and Keeneland Racetrack) to the Bluegrass Parkway. Take the Bluegrass Parkway west to the Harrodsburg/Danville exit (Hwy 127). Take Hwy 127 south approximately 16 miles to Harrodsburg. Turn right (west) onto Hwy 68 to Perryville. Once in Perryville, turn right at the first light and left at the next light. This will still be Hwy 68. Follow Hwy 68 until you reach Hwy 243. Turn south on Hwy 243. After passing through Gravel Switch, Hwy 243 will turn left and Hwy 337 will go straight. Follow Hwy 243 to the left. After a few miles, Hwy 243 will turn to the right (south). Turn right with Hwy. 243, cross the bridge and then turn right again, off the main road. You will see Penn's Store straight ahead in front of you..
Take Interstate 65 south to the Clermont exit (Hwy 245). Turn south on Hwy 245 and follow it to Bardstown. Once at Bardstown, continue straight. The road will end at Hwy 150. Turn left onto Hwy. 150 and continue to Perryville. At Once in Perryville, turn right at the first light onto Hwy 68. Follow Hwy 68 until you reach Hwy 243. Turn south on Hwy 243. After passing through Gravel Switch, Hwy 243 will turn left and Hwy 337 will go straight. Follow Hwy 243 to the left. After a few miles, Hwy 243 will turn to the right (south). Turn right with Hwy. 243, cross the bridge and then turn right again, off the main road. You will see Penn's Store straight ahead in front of you. Take Hwy 150 east to Perryville. Once in Perryville, turn right at the first light onto Hwy 68. Follow Hwy 68 until you reach Hwy 243. Turn south on Hwy 243. After passing through Gravel Switch, Hwy 243 will turn left and Hwy 337 will go straight. Follow Hwy 243 to the left. After a few miles, Hwy 243 will turn to the right (south). Turn right with Hwy. 243, cross the bridge and then turn right again, off the main road. You will see Penn's Store straight ahead in front of you. Take Interstate 65 to the Clermont exit (Hwy. 245). Turn south on Hwy 245 and follow it to Bardstown. Once at Bardstown, continue straight. The road will end at Hwy 150. Take Hwy 150 east to Perryville. Once in Perryville, turn right at the first light onto Hwy 68. Follow Hwy 68 until you reach Hwy 243. Turn south on Hwy 243. After passing through Gravel Switch, Hwy 243 will turn left and Hwy 337 will go straight. Follow Hwy 243 to the left. After a few miles, Hwy 243 will turn to the right (south). Turn right with Hwy. 243, cross the bridge and then turn right again, off the main road. You will see Penn's Store straight ahead in front of you. Take Hwy.68 west toward Lebanon. Turn south (left) onto Hwy 243. After passing through Gravel Switch, Hwy 243 will turn left and Hwy 337 will go straight. Follow Hwy 243 to the left. After a few miles, Hwy 243 will turn to the right (south). Turn right with Hwy. 243, cross the bridge and then turn right again, off the main road. Penn's Store is straight ahead. Take Hwy 150 west to Perryville. Once in Perryville, turn west (left) onto Hwy 68. Turn south (left) onto Hwy 243. After passing through Gravel Switch, Hwy 243 will turn left and Hwy 337 will go straight. Follow Hwy 243 to the left. After a few miles, Hwy 243 will turn to the right (south). Turn right with Hwy. 243, cross the bridge and then turn right again, off the main road. Penn's Store is straight ahead. Take Hwy 68 east and follow for approximately 10.5 miles. Turn south (right) onto Hwy 243. After passing through Gravel Switch, Hwy 243 will turn left and Hwy 337 will go straight. Follow Hwy 243 to the left. After a few miles, Hwy 243 will turn to the right (south). Turn right with Hwy. 243, cross the bridge and then turn right again, off the main road. Penn's Store is straight ahead. Take KY Hwy 300 west. After crossing the railroad tracks, turn south (left) onto White Oak Road (Hwy 37). Follow Hwy 37 to KY 243. Turn south (left) onto Hwy 243. Immediately after turning onto Hwy 243 you will cross a bridge. After crossing the bridge, turn right off of the main road. Penn's Store is straight ahead. Take Hwy 78 west. Turn north (right) onto Hwy. 243. Follow for approximately 6 miles. Just before Hwy 243 intersects with Hwy 37, turn left onto a side road. Penn's Store is straight ahead. Take Interstate I-75 to the US 150 exit. Turn west onto Hwy. 150 and follow US150 to Danville. In Danville turn left onto US127 south to Junction City. Turn right onto KY 300 in Junction City. You will see a BP station on your left at the turn light. After crossing the railroad track turn right onto White Oak Road (KY37) and follow that road to KY 243. Turn left onto KY 243 and after crossing the bridge immediately turn right onto Penn's Store Road. You will see the store right in front of you. Take Hwy 27 north to Stanford. Turn west (left) onto Hwy 150 and go through downtown Stanford. Turn west (left) onto Hwy. 78. Turn north (right) onto Hwy. 243. Follow for approximately 6 miles. Just before Hwy 243 intersects with Hwy 37, turn left onto a side road. Penn's Store is straight ahead. Take Hwy 127 north to Hwy 78. Turn west (left) onto Hwy 78. Turn north (right) onto Hwy. 243. Follow for approximately 6 miles. Just before Hwy 243 intersects with Hwy 37, turn left onto a side road. Penn's Store is straight ahead.